Last week at Crossroads CONNECT (First Trinity’s Thursday Night Activity for High School Students) we talked about the lies Satan tells us. After playing a game of Jenga we connected the game with our lives. 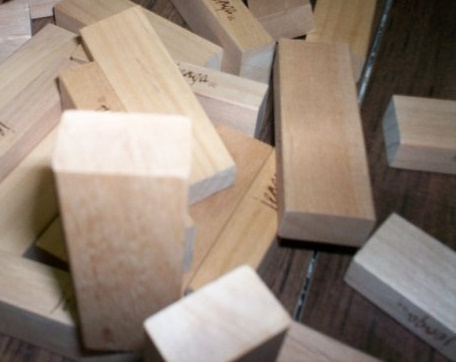 The lies Satan tells us and the things he tempts us to do don’t seem like such a big deal… kind of like one block removed from the Jenga tower. But, as Satan tells us lie afte lie after lie, we’re not who we were originally created to be. And eventually, we’re so broken we crumble to pieces. Thankfully we have a God who sent his Son to dwell among us and build us back up the way he originally created us to be. Then they wrote down the Truth about that situation, found Bible verses to support the truth, and wrote a prayer they could pray whenever they felt like Satan’s lie was actually real. I thought I’d share just a few examples of what they came up with. They really did an awesome job! Lie: God is just a thing of the past. Truth: God is alive and present, with us TODAY! God, help me know that you are always with me, through everything I see every day. In Your Name I pray, Amen. Lie: God is causing these bad things to happen in your life. Truth: God is good. We may not understand what is happening in life, but He is good. Dear Lord, I don’t understand why bad things happen in life and why I struggle. Remind me in these hard times of the simple truth that YOU ARE GOOD. Even when that’s hard for me to believe, help me know it is true. You can take the things people and Satan intend for harm in my life and make them into something good. Be with me as I wait to see the good you have in these hard situation in my life right now. In Jesus’ Name, Amen. Lie: If you don’t have _______ (a boyfriend, a girlfriend, the newest clothes/ipod, etc.) something is wrong with you. Truth: God has made you perfect just the way you are. You are completely whole in Him. Jesus, it’s hard for me to look around and see everyone around me that has ______ (a boy/girlfriend, the newest clothes/ipod, etc.). Help me to see that you are more than enough for me… that you have made me perfect and whole just the way I am and that I can find who I am in You. In Jesus’ Name, Amen. Previous postWhen I Forget God’s Love.